Thanks to all who commented on my book giveaway. Congratulations to The Nelipot Mommy– hope you enjoy it as much as I did! What a busy weekend we had- for the most part it was great, but not without a little stress to keep things interesting. Saturday I attended a reunion for my Little League softball team from 20 years ago, and no, I hadn’t seen these girls in 20 years! It was held at a restaurant where we used to go after games. It was a ton of fun to catch up and bring back such great memories. Softball was such a huge part of my childhood; although I will never push Charlotte into it if it’s not her thing, I would love to be a softball mom and teach my daughter to pitch (and also I am scared to death of being a dance mom- ha!). Later that afternoon, because I am trying to brainwash my daughter into being a softball player support my husband, I took her and her brother to Ryan’s softball tournament. We got there late, so only got to watch a few innings, but it was nice to be out of the house with both kiddos (I brought our nurse with us to help- I am NOT SuperMom) and enjoy our 70 degree February weather. Today my sister in law and a friend gave Charlotte and me a sweet sip and see baby shower. Once again, I am so overwhelmed by the generosity and love shown to our family. Little Charlotte received so many adorable gifts and I know she loved all the attention (although she was asleep for most of the party!). 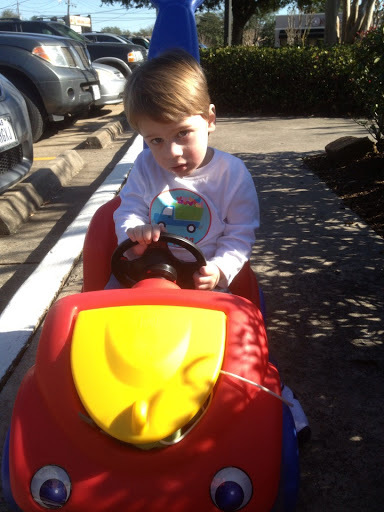 We had planned for Ryan to drop my mom and me off at the party and then him to take Grayson to get a haircut. But about 30 minutes before we were going to leave, Grayson started seizing, and it was a bad one. We gave him his emergency meds and after about 20 minutes he passed out asleep. We made the decision not to take him to the hospital, because every time we take him for a seizure, there’s really nothing they can do. He stayed home with his daddy and slept all afternoon and is in his bed now snoring really loudly. We just never know with Grayson, and are learning that we can’t count on any plans to go the way we expect them to, because he can be completely fine one minute and in an instant, not. It’s scary and it’s sad and it’s frustrating, but it’s life. We just roll with it and move on. I’m expecting a phone call tomorrow regarding the clinical trial drug we want Grayson to qualify for; it may be nothing, but I do have a glimmer of hope that we may be getting closer to a possible treatment for our little guy. This is the first of 24 letters I will write you each month up to your second birthday. Yes, you will have to endure taking pictures with these silly stickers for that long. Sorry. And I know each time I write to you, I will want to start with, I can’t believe you are ALREADY _____ months old! Slow down, time! 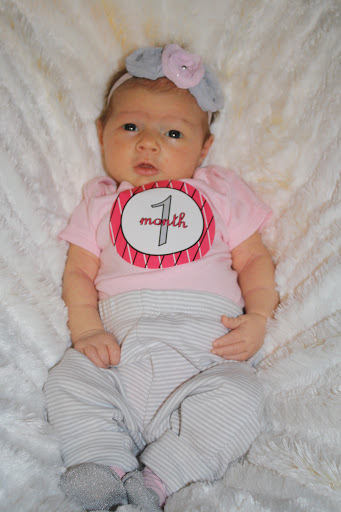 So, my sweet girl, I can’t believe you are ALREADY one month old! Slow down, time! 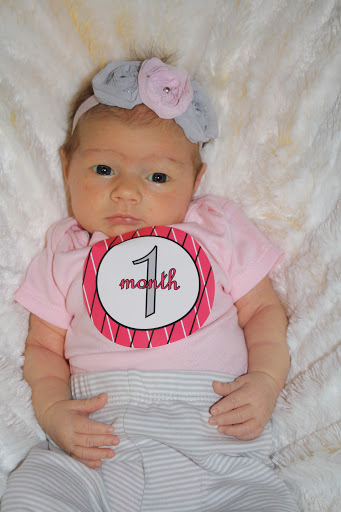 Seriously, I have loved every day of your first month so much. You are such a sweet, beautiful, good baby that I told your Grammie yesterday you are going to turn me into a baby hoarder. I just love this newborn stage- the smell of your head, the way you arch your back and grunt when you are waking up, your legs that are getting chubbier by the day, and the sweet way you fall asleep on my chest. Let’s just stay here in this stage forever, ok? But as much as I love this stage you are in, I know that we really can’t stay here forever. You are already growing and changing, and I am determined to enjoy and cherish every step of your childhood. Charlotte, you are so, so loved- by your Mommy and Daddy, your brother, grandparents, aunts and uncles, and countless friends who have prayed for you and celebrated your arrival. You are one special little lady who has made my heart explode with love and joy this month. We have a lot of stress and worry in our family, but you are an amazing light in that darkness. I thank God for the unexpected and wonderful gift of you, my daughter. I hope you will always know how special and loved you are. Do You Wear Sparkly Green Earrings? 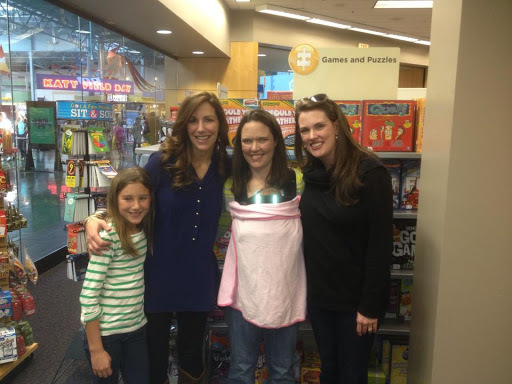 Last Saturday, Lisa, Charlotte and I had so much fun meeting Melanie Shankle, aka Big Mama, and her daughter Caroline at a book signing for Melanie’s new book, Sparkly Green Earrings. If you don’t know who Melanie is, you MUST start following her blog TODAY. She usually posts 5 days a week and never fails to make me snort with laughter. She also is a regular contributor on the Pioneer Woman’s blog. She is funny, honest, and an incredible writer. Reading her posts are one of the highlights of my days 3 am nursing sessions. Melanie and Caroline were just as adorable and sweet in person as they are on the internet. We chatted for a few minutes about Texas A&M, friends, and how having a girl really does get you in trouble what with all the cute clothing they just have to have. Then they both signed our books and we took a picture. Cute, except I look so dumb with Charlotte’s blanket covering my whole body- ugh, should have moved it- oh well. 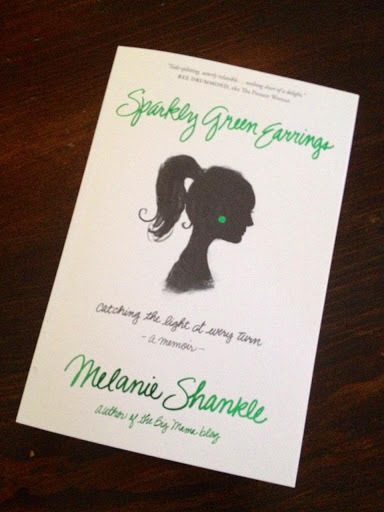 Anyway, I read Sparkly Green Earrings in a day, and it did not disappoint. It’s a memoir about motherhood, and it made me laugh, cry and want to keep reading and reading. When it was over, I wished there was more (Caroline is only in elementary school, so hopefully there will be a sequel or two!). One of my favorite lines in the book, because yeah, this IS my life…I don’t know if this is in any of those books about parenting, but if I had to give you a definition of what motherhood really looks like, I might just say it’s a woman who catches her child’s throw up. With her bare hands. YEP. I loved this book so much, and I want to do a giveaway and give a copy to one of you! Leave a comment and I’ll use a random number generator to pick a winner tomorrow. Here is the promo video for the book- warning, it’s a tear-jerker! I realized as I opened a new page to blog tonight that this is my 300th post, and that probably warrants a little effort on my part to come up with something thoughtful. 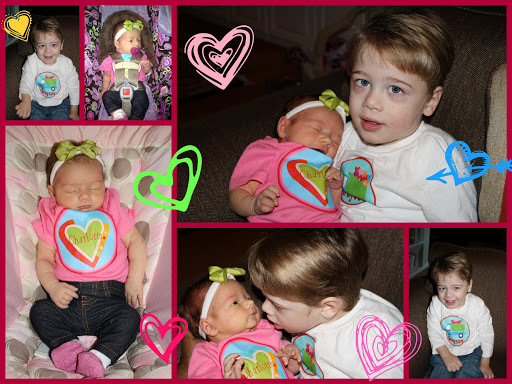 I wasn’t sure what I wanted to write about, only that I feel an intense need to write about my babies. 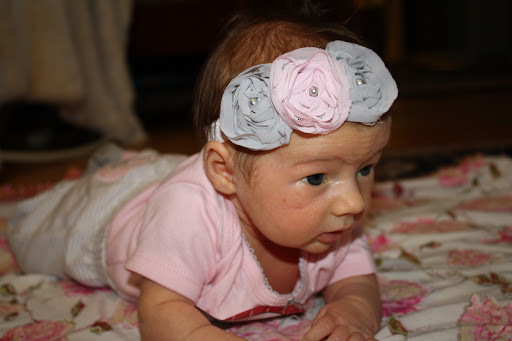 And those babies are the reason for this blog- to document their childhoods and my journey of motherhood, so I don’t forget all the little moments that matter so much, but are so quickly forgotten unless they are written down. Today I was filling out the form to participate in PAIL’s Monday Snapshot and got stuck on the question asking me for one word that describes me. My first thoughts were”tired” and “disheveled” because well, yeah, TRUTH, but that probably isn’t exactly what they are looking for. Then as I focused in on my two year old sucking his thumb in his still-beloved baby gym while listening to his still-beloved Veggie Tales and my four week old sleeping peacefully in her swing, I thought- blessed. These children of mine are exhausting, both physically and emotionally, but they are also more precious and amazing than I could have ever hoped for. And that I get to stay at home with them is a blessing I need to be sure never to take for granted. Grayson is heartbreakingly difficult to spend long days with. He is fussy, loses his balance and hurts himself a lot, and his body is heavy, stiff and very hard to hold. He is so limited in his activities and is outgrowing his baby equipment rapidly. We are in a phase where he hates baths and is waking up crying several times a night (and is under the ridiculous assumption that 4 am is an acceptable wake up time). It’s hard. But Grayson is also incredibly sweet, loves to laugh and be sung to, and mercifully still goes to bed between 5:30 and 6:00 pm. He adores his swing, his music, and riding the elevator in Grammie’s house. He now goes to school 5 days a week and is thriving on the schedule and stimulation he gets there. For 28 months, Grayson was my baby boy. But now, suddenly, he’s been transformed into my big kid. Becoming a Big Brother has truly made Grayson BIG- his hands and feet, his giant diapers, his hair that grows at a pace way faster than I can think about making an appointment to get it cut. And what the heck, he’s even driving! No, my baby boy isn’t so much a baby any more, but he’s here, and he knows how much he’s loved by so many. Charlotte is truly my gift from God. 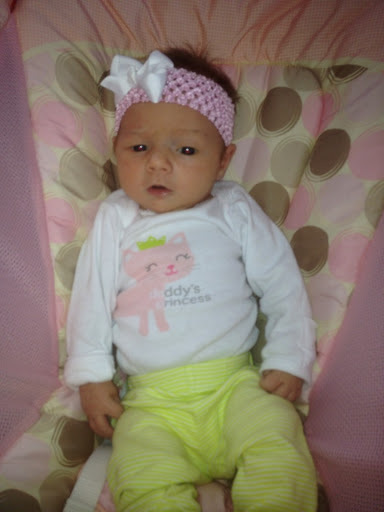 My counselor told me last week that God knew I needed a little girl. And I’m realizing how much I really did want her to be a girl, even though having a daughter is both amazing and terrifying. And, as I’m learning, expensive. 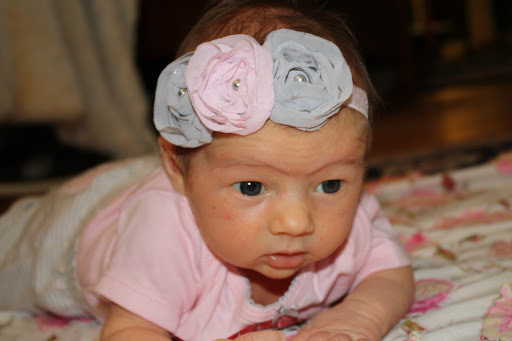 These past four weeks have been my chance to truly relish the newborn phase. With Grayson, I was so happy and excited to have a baby, but spent much of his early weeks and months worried and afraid. He was so little I was always terrified he was going to slip through my arms as I carried him across the room. I constantly worried about how little he was eating, how behind on the growth chart he was, and what milestones he wasn’t meeting. With Charlotte, I am so much more relaxed and I have been conscious to enjoy these days and pay attention, because I know how fast they go. We have spent hours and hours just being still, her head on my chest as I breathe in her intoxicating newborn scent. Most nights, she spends at least a few hours asleep on me instead of in her bed, because I just want to remember her smallness. Charlotte is already learning to go with the flow, and is so far an incredibly content, chill baby. She rarely cries and is happy as long as she’s warm, cuddled and fed. I prayed for a baby who would eat, and I got one. She eats and eats and eats, and then eats some more. She truly is healing me from two years of constant feeding struggles and worry. This baby girl- not my plan but God’s, and His plan is always so much sweeter than mine anyway. I just couldn’t love this little angel more. Yesterday kicked off this year’s Feeding Tube Awareness week. As with just about everything in my life right now, I’m about a day behind. But even with all the craziness in our world right now, I really want to participate and spread awareness as much as I can this week. Yesterday, I was supposed to: Tell your story. 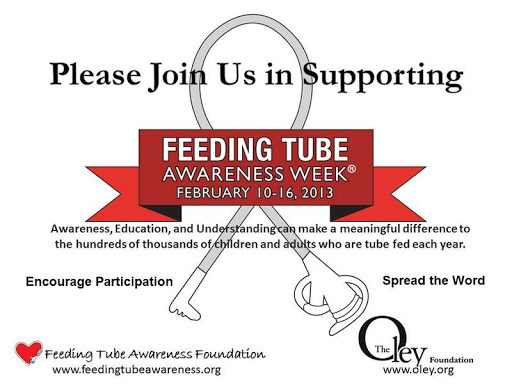 Educate others about what life is like with a feeding tube and with your child’s/family member’s/your medical condition. Why does your child/Why do you have a tube. There have been some changes with Grayson’s feeding tube since last year. He no longer has a G-tube, but a GJ-tube, which bypasses his stomach and feeds his formula directly into his intestines. If we are able at some point to go back to feeding him in his stomach, the button has a G-port that we would be able to do that. At this point, we do not see that happening any time soon. Since his feeds go directly into his intestines and the intestines do not expand like the stomach does, he cannot do bolus feeds; he has to be fed continuously throughout the day and night. Grayson’s feeding pole and backpack are so much a part of him that I rarely think about it any more, although I have to be really careful not to catch the tubing on anything or pull it when I’m changing his diaper. In fact, I catch myself checking for a tube and being careful of a button when I pick up Charlotte (crazy things our minds do!). Right now, Grayson eats nothing by mouth. He will occasionally taste a bite of food and even swallow some (although usually he vomits it back up) and we expect his feeding tube to be a permanent thing. I have accepted this and am mostly just grateful because his tube literally keeps him alive! For me, the decision to tube feed was not difficult. Although the prospect of surgery was scary, my child projectile vomiting up what he was taking by mouth (which wasn’t much) and being deemed failure to thrive was a whole lot scarier. There is definitely a learning curve when it comes to learning and being comfortable with the feeding equipment, but like I said above, it quickly becomes second nature and for Grayson, the benefits have been huge. My biggest advice: ask for advice, and not from your doctor. Get connected with other tubie parents who know tricks and can help you troubleshoot. Like the Feeding Tube Awareness facebook page and don’t be afraid to ask questions. Make as many connections as you can, because you will feel less alone. I am really going to try and blog the rest of the prompts this week, although I may have to double up some again. And if you have any questions about Grayson and/or tube feeding, please ask!